Using the Adviser Trust Model, a practice’s performance on the four pillars of trust and the respective foundations can be measured and mapped against the importance of each pillar to show where an adviser and/or practice is doing well and where further work is needed to drive trust and the specific actions that will achieve this. 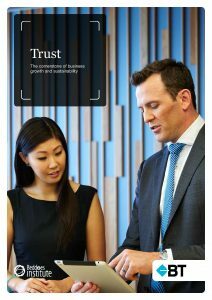 In addition, ‘Most Trusted Advisers’ (MTA) were identified from within Beddoes Institute’s database and profiled in this white paper to demonstrate the benefits of high trust adviser-client relationships. These advisers were found to produce better economic outcomes for their clients, to have more satisfied clients and to experience a range of operational benefits in their businesses. Provided a pathway, including specific actions and initiatives, for building high trust adviser-client relationships. Advisers, practices, dealer groups and institutions can use this to productively work on their own individual performance in communicating trustworthiness to clients and winning their trust through word and action. Read more about the Most Trusted Advisers Network and the Advisers online.